Welcome to the Batman Arkham Origins Comms Towers & Network Relays locations guide that helps you find the total of 7 GCR Comms Towers locations & 70 Network Relays locations in the Xbox 360, PS3, PC & Wii U action-adventure game. * Restore GCR Comms Towers to unlock Batwing Drop Points (for fast travel) and reveal Enigma’s Network Relays. * Then destroy all Network Relays to access the server at Enigma’s HQ. * Bonus: Each hacked Comms Towers earns you 5,000 XP, and each destroyed Network Relay rewards you with 2,000 XP. The overview of all these in-game Comms Towers & Network Relays locations is listed below. How to find missing Comms Towers & Network Relays? : Enigma has placed jamming devices at each of the GCR Comms Towers. There are seven in all, one in each district. 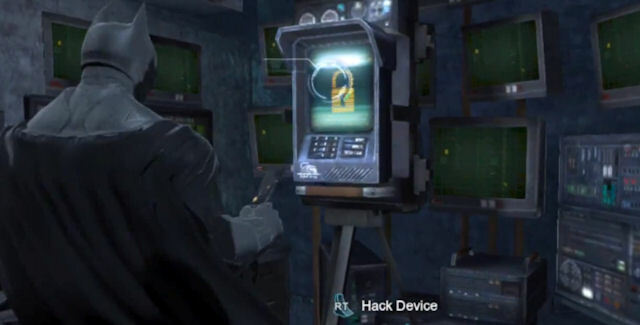 Batman must figure out how to get inside the Tower Maintenance Access of each tower and hack into the security console. Once you’ve removed the interface, you then have access to the Batwing Drop Point in that district. Plus, the locations of 10 Network Relays in the area are revealed on the map. You must destroy the relays with a Batarang. Tip: If you aren’t able to access a certain area with a Comms Tower yet, it’s probably because you haven’t progressed far enough into the story, and thus don’t have the required upgrade yet (like the shock gloves or special grenades). So keep playing the campaign and come back later once your weapons arsenal is better equipped. Does the game save each Comms Tower & Network Relay you disable? : Yes, the game will automatically save the Comms Towers & Network Relays you just collected if you hacked & destroy the Comms Tower & Network Relay, respectively, so you don’t have to play to the end of the mission. After finding each location and completing your side-mission you can safely quit the mission without losing collectibles progress. Where to find all Comms Towers & Network Relays in Batman Arkham Origins? The in-game collectibles locations for the Comms Towers & Network Relays are described in this detailed video guide. The Comms Towers & Network Relays are listed in the videos in the order that they appear, with plenty of added voice-over tips and map locations. The Batman: Arkham Origins – Comms Towers & Network Relays Locations Guide continues on Page 2 with the rest.